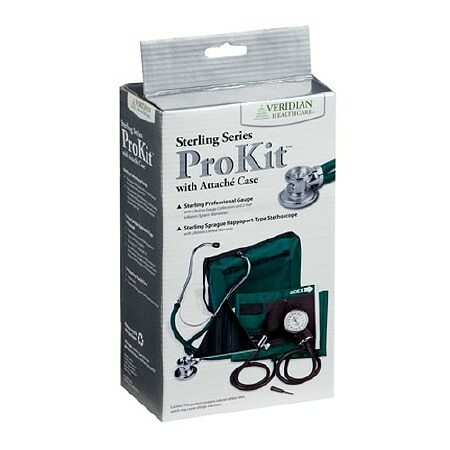 Veridian Healthcare Sterling ProKit Adjustable Aneroid Sphygmomanometer with Sprague Stethoscope Hunter Green1.0 ea. Outstanding quality and versatility come together in convenient all-in-one, professional kits. ProKits are ideal for nurses, students and EMTs. Sterling Professional Gauge: Deluxe adjustable gauge with luminescent faceplate allows the user to easily set the gauge to zero. Deluxe air release valve and bulb and coordinating calibrated nylon adult cuff. Sterling Sprague Rappaport-Type Stethoscope: Heavy-walled double tubing and chrome-plated zinc alloy rotating chestpiece. Tube length: 22-inch; total length: 30-inch. Includes: adjustable black gauge with white faceplate, mini screwdriver, deluxe air release valve, inflation bulb with deluxe end valve, 2-tube bladder, black calibrated nylon cuff, Sprague Rappaport-type stethoscope, two spare sets of eartips, three bells (small, medium and large), two diaphragms (small and large), chestpiece key and roomy zippered fanny pack.